Da da da! I give you the ginormous and ridiculously, unbelievably pointy—well they are part of the Rockies—awe inspiring, jaw-droppingly, Hollywood special effect-y Grand, Middle and South Teton mountains. Take a look at these babies. 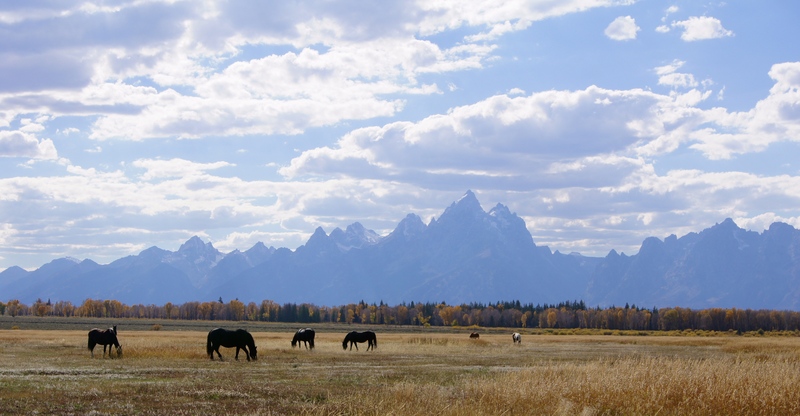 The Grand Teton National Park is just one of those special places that you don’t want to listen to music or read a book (while someone else is driving!) or make conversation dare you miss out on any of the wild and majestic scenery. Each curve of the road brought the mountains into view, visible throughout the park and, if I may say, each new vista and viewpoint brought, somehow, an even better view. Sunrise? Check. Pink and mysterious and misty. Sunset? Yep. Check it out. We oh so secretly tramped through another campsite in the Gros Ventre campground to get this picture. We had to. What you don’t see is the field full of white-butted deer, unworthy of our attention, shadowed by this flirty mountain range rising mystically into the clouds 7,000 feet above us. First of all, as we rolled through the Jenny Lake campground, we were super-jealous of the tent campers and would highly recommend this spot. In retrospect, we should have ditched our tent trailer in the parking lot, trading it for the tent we decided to leave at home. Next time. This campground not only supplies views for days but the sites were spacious and private, two features we hadn’t seen in national park campgrounds until now. After a few moments of regret, we picked ourselves up from a mental tantrum and decided a hike would make us feel better. From the Jenny Lake parking lot, you have two options, one lazy (boat shuttle) and one awesome (leg locomotion). Heading clockwise around the lake to Hidden Falls, a very nice lumbersexual convinced us to check out Moose Ponds to see the beaver dam and the herd of moose. A flat 2.7 miles later, Indi, our little magpie, had pockets full of metamorphic and igneous quartzite, silica and mica studded rocks. We got to check out the beaver dam and evidence of the yellow-toothed rodents but only heard and didn’t see any moose on this hike. When we made it back to the trail, we headed to Hidden Falls for lunch and then round-tripped our way back to the parking lot. Total miles hiked: 7.7. Calories worked off: who cares? On our way back to our campsite, we accidently stumbled upon a really cool old homestead and decided to check it out. The gravel road brought us to Mormon Row, previously homesteaded with 17 buildings, and originally named Grovont. Now, as you can see, there are only a few rickety testaments to the Mormons who left their comfortable lives in Salt Lake City and Idaho to expand new communities in the rocky soil in the shadow of the Grand Teton mountains. 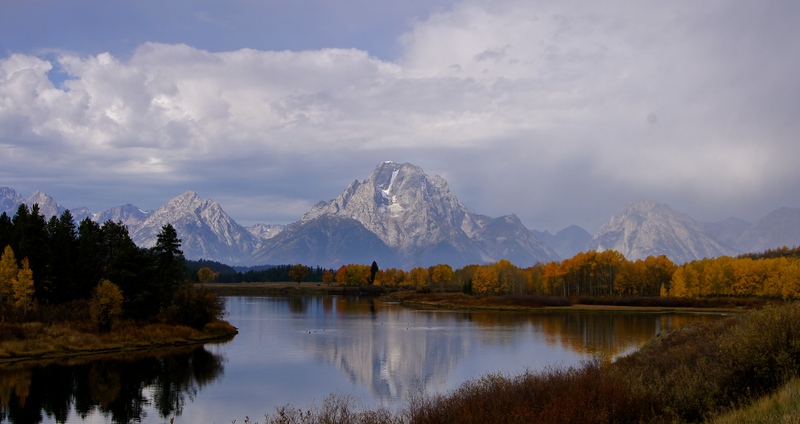 We loved our time at Grand Teton National Park and the moose, beavers, water features, and wide-open sky and scenery. Next time, we will make sure to hike the Two Ocean Lake Loop (the trail was closed due to contained burning), we will stay at the Jenny Lake campground, and stay away from the uppity town of Jackson Hole. Next stop: The Rocky Mountains! Happy you’re enjoying your adventures! So true about more and more beauty around every corner!